The first feature to note is that the term was extremely common. There were just over 400,000 hits for ‘the people’ in the 44,313 transcribed texts on EBBO. It turns up at least once in over half of these texts (about 23,000), with the first instance found in the very first book printed in English, Claxton’s edition of The Recuyell of the Historyes of Troye (1473). As a result, I realized the any pretence of ‘close reading’ was impossible for such a huge collection. However, a bit of ‘distant reading’ suggested some notable changes over time. A project called ‘Early Modern Print: Text Mining Early Printed English’ lets you create the equivalent of google ngrams for the EBBO-TCP corpus. It is a wonderful way to spend an afternoon if you’re bibliophiliacally-inclined. 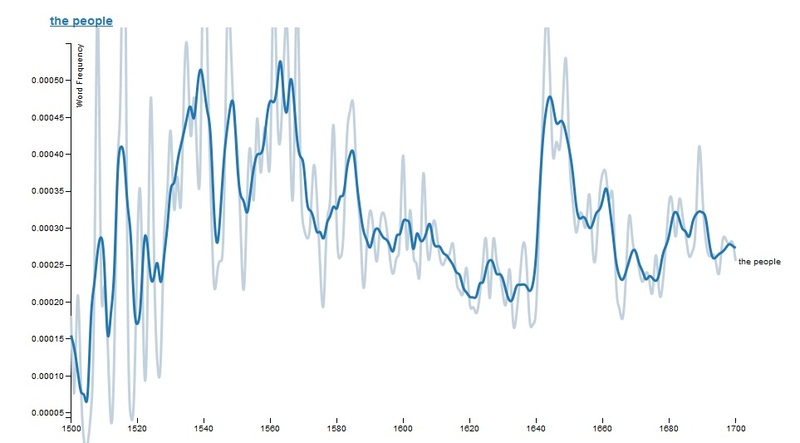 For ‘the people’, the result was a chart which implied a generally growing use of the term in the sixteenth century, but it would be hazardous to read much into the variation under the Tudors as there were relatively few texts from this period. This was followed by a mild decline in the early seventeenth, a huge leap in the 1640s and 50s during the civil wars and interregnum, a drop and then a mild increase in the 1680s, perhaps with a spike around 1689. None of these variations are especially surprising, though it is interesting to see how closely tied ‘the people’ is to specific political events. However this doesn’t tell us what the term actually meant in early modern England. For that you’d need to properly read through some sort of a representative sample of the 24,000 texts. I haven’t done that, but I did quickly skim some of the results. From this, my impression is that ‘the people’ tended to refer to three somewhat distinct entities: the laity, the commons, or the population of a specific place. (1) The laity. The famed reformer Hugh Latimer preached a sermon to parliament in 1537 in which he declared that ‘The worldlynges, if they spye profyte, gaynes, lucre, in any thynge, be it never suche a tryfle, be it never so pernicious, they preache it to the people’. He used this term 14 times in this sermon, nearly always to refer to laypeople in contrast to the clergy. This seems to have been one of the most common forms of the phrase, and it is a useful reminder of the fact that the phrase is historically specific. Few writers would define the term this way today. It is also a reminder that what we might think of as a ‘social description’ could be as much about religion as about wealth or title. (2) The commons. In 1581, William Stafford published a dialogue on the complaints of ‘diverse of our country men’ in which ‘The Doctor’ argued that a standing army was ‘a continuall yoake & charge both to the Prince and the people’. This phrase – ‘the prince and the people’ – can be found in over 100 texts from the period and is part of a wider discourse in which ‘the people’ are those who are ruled (or represented) by higher political authorities. They are, in other words, the ‘subjects’ of the kingdom or ‘citizens’ of the urban corporations. Above them are the monarch, the nobility and the magistrates. 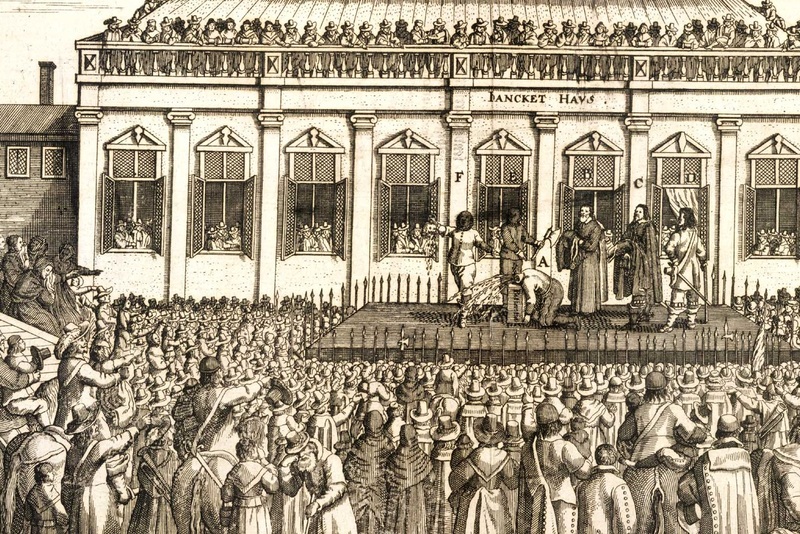 This conception becomes especially important during the revolutionary moments of political crisis and open debate in the 1640s and in 1688-89. Hence, in 1649 an army preacher named Edward Harrison published a pamphlet in which he drew on classical traditions to declare that ‘true Soveraignty was instated upon the good will and liking of the PEOPLE’. He was one of many who insisted on an important role for the people in the state. They were, after all, the ‘demos’ in ‘democracy’. (3) The whole population. Archbishop George Abbot published A Brief Description of the Whole World (1611) in which he described the conquest of ‘the people of Rome’, the ‘rude and heathenish’ nature of ‘the people of Lapland’, the ‘very skilful Worke-men’ amongst ‘the people of China’, and the characters of about twenty other peoples around the globe. The word ‘population’ was virtually unknown in its modern sense before the 18th century, so authors tended to use ‘the people’ instead as a term to describe all the inhabitants of a particular country or locality. Thanks to the influence of the Old Testament, most common of all was ‘the people of Israel’, which appeared in 2,416 of the texts, many more than those which mentioned ‘the people of England’. So, what does this tell us? I was pleasantly surprised by the results of this superficial little exercise in etymological research. Often such brutish rooting around in EBBO fails to turn up much of anything except the blindingly obvious, but this time I resisted the urge to check the OED before diving in, so the prevalence of the laity and of the population as definitions of ‘the people’ was genuinely unexpected. Perhaps the most important lesson I took from this is a simple one. The rhetoric of ‘the people’ clearly became more popular in print during moments of political crisis and it could carry strong political overtones. Yet, it was just as often used in an ecclesiastical or geographical sense. These other uses show that we mustn’t assume that political power was the primary way for people to think about their place in society. The conceptual divisions between the clergy and the laity, or between the inhabitants of different places, could be just as important. Of course this was just a brief look at a bunch of online transcriptions of published texts. To get a better sense of ‘the people’, it will be essential to look at some unpublished manuscripts as well, but that will have to wait for a subsequent post. In the meantime, I’d welcome your thoughts on what these definitions might mean for our understanding of the period. This entry was posted in History and tagged classy history, nomenclature, the people? by Brodie Waddell. Bookmark the permalink. Yes, the EBBO-TCP text corpus definitely over-represents ‘religious’ meanings. It is easy to forget that a huge proportion (most?) texts published in this period were authored by one particular professional group: clergymen. I’m sure the numbers would look very different if one looked only at books authored by, say, lawyers or merchants. Or if one looked only at, say, plays. As we’ll see, ‘the people’ as ‘the laity’ is virtually absent in the manuscripts I’ve looked at. Yes, brilliant post, thanks Brodie! Thank you for making myself (and others) aware of the Early Modern Print text mining resource – it wasn’t something I’d come across before, and one of the PhD students I supervise has already, inspired by your post, used it to great effect to chart changing patterns in the occurrence of certain religious terms over the period. The view of ‘the people’ is also something that came up in my special subject class this week, in a discussion of Elizabeth I’s 1580 ‘Proclamation against the secatries of the family of love’ (STC2 8125). The group were, quite understandably, a little surprised that Elizabeth refers several times to her ‘people’ as ‘simple unlearned’ and ‘ignorant & simple’. The context is partly polemical – these are people who have been mislead by dangerous sectaries. But it reinforces the second sense you drew out in your post, of ‘people’ as synonymous with ‘the commons’. I’m so pleased to hear the EEBO-TCP ngram tool is being put to good use. Of course, it doesn’t tell us much on its own, but it is a great way to take a first step towards understanding the changing prevalence of particular concepts and ideas. Regarding the 1580 Proclamation, it would be very interesting to do an analysis of how ‘the people’ (or equivalent) were presented in ‘official’ texts such as proclamations and acts of parliament. I’m sure they changed dramatically in the mid-17th century and it would be great to get a more precise sense of the official perspective. There’s an undergrad dissertation for anyone who wants it!